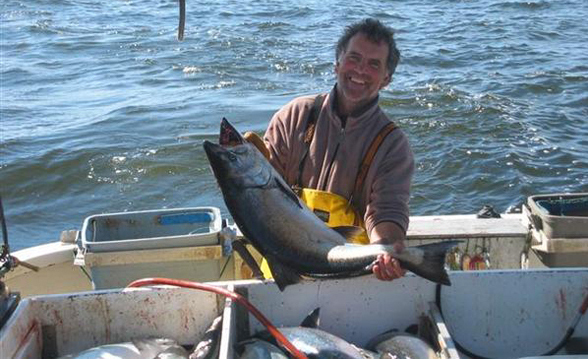 Few fisheries in the world can match troll-caught wild salmon in quality and freshness. The slow-paced and selective nature of trolling means that each salmon is individually hauled aboard by hand, carefully handled, conscientiously cleaned, thoroughly washed and either iced or frozen at sea. For the fishermen, trolling is physically draining work, which means the amount of fish caught each day tends to be much lower than in gillnet and seine fisheries. The fish also tends to be higher quality because it is caught at sea. Seine and gillnet fisheries typically occur at the mouth of or in rivers, where salmon stop feeding and begin to deteriorate on their migration to the spawning grounds. Nets also tend to scar salmon when they are caught. For this reason, quality—rather than quantity—is the hallmark of troll-caught wild salmon, one of the top quality fish on the market. Some trollers are “day boats,” meaning they return each day to deliver their catch to the market. Most trollers, however, go on short trips of two to five days at sea, cleaning, washing and icing their catch each day. The salmon are individually packed in salted, flaky ice in the vessel’s hold to maintain freshness. Trollers can also freeze their catch at sea. Salmon are caught, cleaned, washed, dipped in a saltwater glaze and then flash frozen to a core temperature of -30 degrees Celsius. The glaze prevents dehydration and locks in the freshness. Freezing takes place within only hours of the salmon being caught so that when the fish is thawed it has the quality of being freshly caught. That’s why many fishermen refer to these fish as “fresh-frozen” and why they are the preferred catch for sushi restaurants. 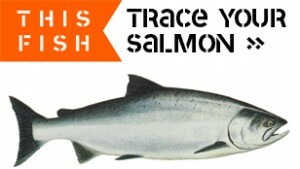 This entry was posted on Tuesday, January 11th, 2011 at 9:52 pm	and is filed under WILD SALMON and tagged with quality, wild salmon. You can follow any responses to this entry through the RSS 2.0 feed.